There are so many ways a person can get in shape it can often be overwhelming with all the different choices. That’s why using a treadmill is such an effective way to get fit and burn fat as it will suit people of all abilities and ages and you will see results. Why do intervals on the treadmill? Interval training on a treadmill offers the chance to work harder in a shorter amount of time. Varying speeds combined with hills will challenge you and offer variety. You will build endurance and develop your muscles (quads, hamstrings, glutes and calves) but also work your abs by maintaining a good posture. Combining walking with jogging or building up to more intense efforts such as shorts sprints are achievable through interval training methods. Interval training has been proven in many studies to increase the fat burning effects of exercise. Following these workouts your body experiences the ‘EPOC’ effect – ‘excess postexercise oxygen consumption’ where you are basically burning more calories to physically recover from your workout! Using treadmills are a great way to build up your fitness to achieve a particular goal, such as completing a 5km running event. 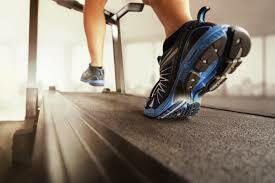 Professional runners to beginners can take advantage of a treadmill when conditions outside are uncomfortable or unsafe. So don’t discount the treadmill next time you are at the gym – have a great music playlist ready with some interval challenges in mind. The endorphin rush at the end of your workout will keep you coming back for more. 1) Reprinted with permission of the American College of Sports Medicine. Copyright © 2014 American College of Sports Medicine.